In its fiscal year which ended September 30th, so-called revenue passenger trips on the Pinellas Suncoast Transit Authority’s (PSTA) network of buses dropped 4.5% compared to the previous year. PSTA’s ridership is thus now 13% lower than it was 10 years ago. The dismal numbers support the claim of year ago by Randal O’Toole at the CATO Institute that transit as we know it facing an apocalypse due to new technology. In the last two years, the Guardian has reported on PSTA’s declining ridership multiple times (for example here,) the collapse in farebox recovery, and the 40% decline in PSTA’s core ridership of monthly pass buyers. The Guardian is the only news outlet covering the continuing decline in ridership, not just at PSTA, but also at other Florida transit agencies. More on the reasons for the media silence later. Readers should note that a bus “rider” (a.k.a. “a trip”) is one person getting on a bus. 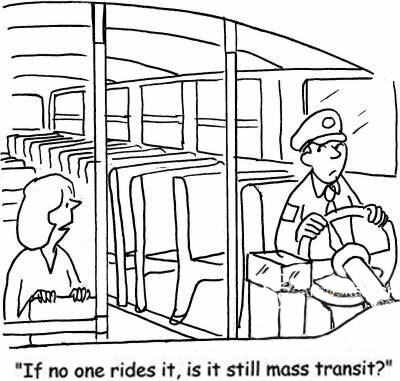 Therefore, a person making a round-trip, changing buses once going in each direction, counts as four “trips”. Therefore, when politicians make statements like “PSTA has one million riders a month”, it is worth remembering that PSTA accounts for only about 1% of all travel in Pinellas County. 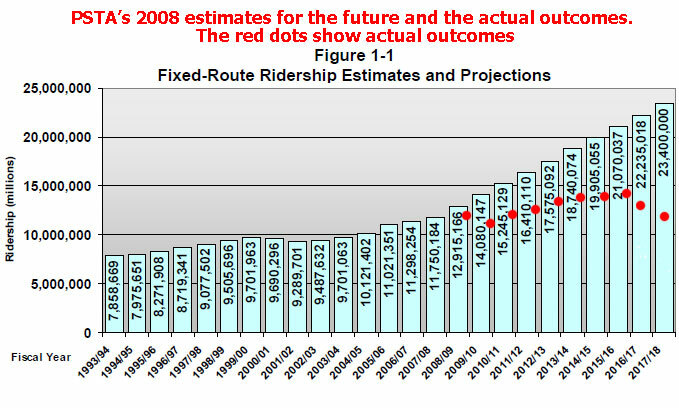 The ridership is less than half the consensus objective of “doubling ridership over the next 10 years, from a projected 11.7 million trips in FY2007/08 to 23.4 million trips in FY 2017/18” stated in the July 2008 PSTA Transit Development Plan (page 119). The 23.4 million number wasn’t just an “objective.” That same plan also contained an “estimate” of 23.4 million fixed-route passengers by FY17. That estimate is shown immediately below. The actual number of fixed-route passengers was 12.1 million in FY17, and decreased to 11.6 million in the year that just ended. Since that 2008 plan, PSTA has raised the property millage rates to fund its operations from 0.56 mils to 0.75 mils, the maximum allowed by state law. PSTA subsidizes Uber and taxi companies to bring people to their buses through the so-called DirectConnect service. As shown immediately below, the number of people availing themselves of Direct Connect has tripled in just 3 months. On the face of it, this would appear to be a positive. However, given that there are no controls to insure that a bus ride actually accompanies the taxpayer subsidized Uber ride, DirectConnect may be an area of abuse to be swept under the rug at a later date. 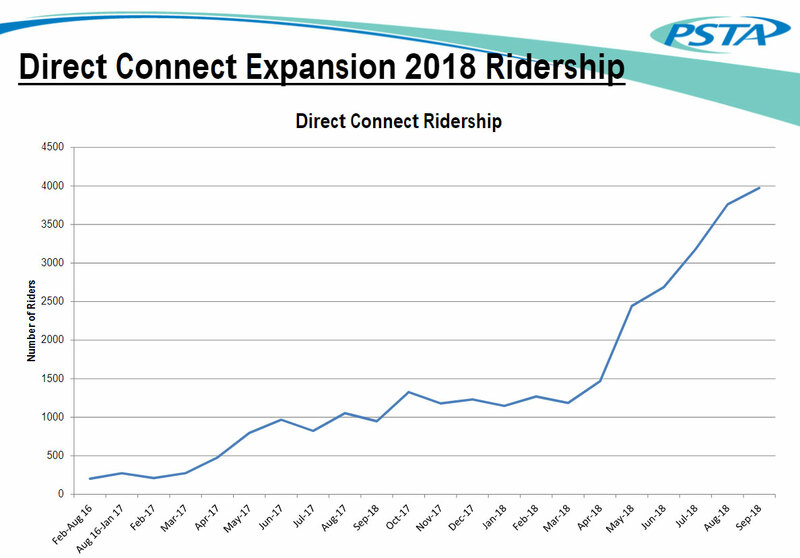 In any event, in the very best case scenario Direct Connect adds less than 0.7 % to PSTA’s ridership. Other local news media ignore the plunging transit ridership because it doesn’t “fit the narrative.” Tampa Bay Lightning owner Jeff Vinik is heavily backing a sales tax hike in Hillsborough to “pay for transit.” The actual objective, however, appears to be to provide tax subsidies for developers to build near rail stations, regardless of how many people actually use the service. Brad Miller, Cato Institute, Direct Connect, Hillsborough sales tax, Jeff Vinik, PSTA, Randall O’Toole, Transit Development Plan, Uber.